Simply put, spring cleaning is a thorough top-to-bottom deep cleaning of your home that often includes efforts to declutter your space. 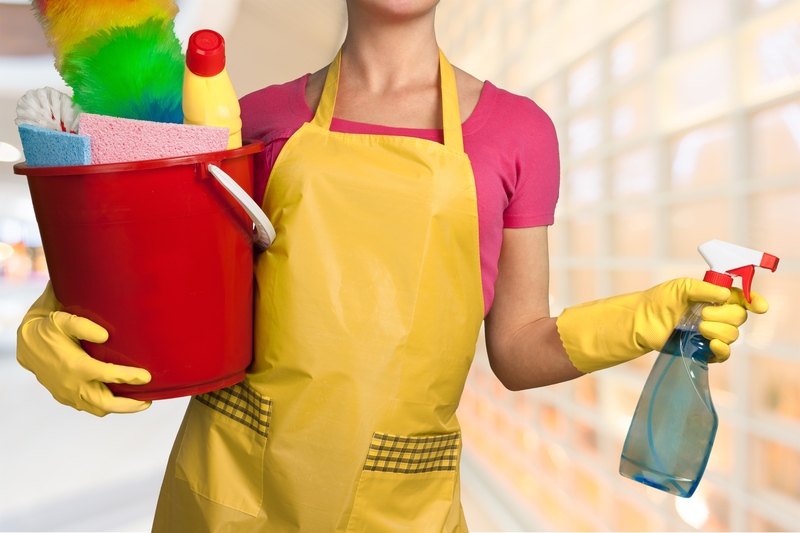 Spring cleaning is a beyond daunting annual task for many households because it means dealing with aspects of cleaning that may have been neglected for months or even years. Maid Brigade consumer health advocate Marie Stegner calls it “overwhelming,” and she’s right to claim that “the majority of people don’t know where to begin.” However, getting started isn’t as hard as you might think. Before you pick up a broom, take some time to create a spring cleaning checklist. While it might sound like busy work at first, you’ll find that creating a list of cleaning priorities will make your spring cleaning endeavors exponentially more effective and far more manageable than a headlong assault on clutter and dust. It’s as simple as listing down a few goals or priorities that you’d like to achieve such as “deep clean the bathroom” or “downsize the number of things hanging in the closet.” So, what’s going to make the cut for your spring cleaning checklist? Below are seven areas to kick-start your spring cleaning endeavor along with easy cleaning tips to ensure you’re creating a safe and healthy living space. The kitchen is one of the highest areas of traffic, as it is the epicenter of life in the home. Here are some of our favorite tips for getting your kitchen clean the green way this spring. ●	Mop linoleum floors with 1 part vinegar to 10 parts hot water. Use a mild, vegetable oil-based soap for wooden or laminate floors. ●	To clean the microwave, heat a bowl of water and lemon slices in your microwave for about 45 seconds, then wipe. Stains will be easier to remove and old food odors are neutralized. ●	Half a lemon stored in your fridge will help control and eliminate unpleasant smells. ●	For a great oven cleaner, combine 1.2 liters of warm water, 2 teaspoons borax, and 2 tablespoons of castile soap. Spray on the solution, wait 20 minutes, wipe with a cloth and rinse with clean water. ●	To give your dishwasher a good clean, run it through a cycle and use baking soda instead of detergent. ●	Sprinkle baking soda onto a damp sponge for cleaning out the fridge without scratching it. ●	Clean stainless steel sinks with a paste of baking soda and vinegar. Don't let the foaming scare you – it works great! The bathroom is often one of the spaces that need the most work in our client’s homes. ●	Before you try to clean grout and tile, we recommend sweeping and then vacuuming along the baseboards to make sure as much dirt is gone before applying a cleaning solution. ●	Equal parts hot water and vinegar is a great solution for cleaning tile surfaces. ●	Grout is one of the toughest areas to clean in your bathroom. Mix a half cup of hydrogen peroxide for every cup of water in a spray bottle. Spray the cleaning mixture on the affected areas. Clean and rinse with water. Depending on what’s in your garage, you might need to create a spring cleaning checklist just for the garage, especially if that garage has become one big closet. ●	Go through and get rid of sports equipment, toys, games and clothes that are no longer being used. Donate as much as you can to thrift stores and charities. Donate old books, DVD's, and CDs to your local library. Recycle plastic bags, paper and cardboard. Return bottle, cans, and glass to the redemption center. Trade in old video games and hardware, unused iPods, calculators, cameras and phones for extra money. Closets are notorious clutter collectors, so spring is an ideal time to cut the clutter and clean out your closet. ●	Reduce clutter by placing seasonal items in the back or off to the side to free up space. You can also store away seasonal items in space saver bags or bins. ●	Follow the guidelines for the garage if you’re dealing with closets that are repositories of electronics, exercise gear and random clutter that rarely or never gets used. Donate, sell, trade or recycle as much as possible. Sometimes, you can clean your whole kitchen and then come back to notice greasy or grimy appliances like the microwave, toaster or blender. ●	Baking soda is a great scouring cleaner to use on the surfaces of your major and small appliances. You can treat them then wipe them down with a damp microfiber cloth to get them back to their original shine. As during any deep clean, spring cleaning demands that you clean all of the surfaces in your home–tables, counter tops, sinks, refrigerators and ovens alike. ●	As we just mentioned, baking soda can be used as a scouring powder to clean sinks, countertops, faucets, ovens and appliances. For tougher stains, add salt or boiling water to the baking soda paste and scrub with a microfiber cloth. Nothing feels more like spring than spotless open windows, so don’t leave them off your list! ●	Dust your windows and window coverings before applying a cleaning solution. ●	To clean windows and mirrors, use a mix of vinegar and water in a spray bottle. Wipe with a microfiber cloth. These days, it helps when spring cleaning is a group effort. The home cleaning experts at Maid Brigade can assist you with the chores of spring cleaning and keep you and your family away from harmful chemicals using our Green Clean Certified products. With 35 years of experience in creating lasting impressions through exemplary customer service, not only will we leave you with a cleaner and healthier home, our maids remove the burden of housework from your schedule. Consistent, reliable, thorough, and affordable are all components of our business philosophy. All of our bonded and insured maids and staff undergo a thorough hiring process with background checks and a detailed training program before ever stepping foot in your home. Call your local Maid Brigade right away or complete a FREE, No Obligation Estimate Form for more details!